Lord Mallikarjuna Swamy (a form of Shiva) and Devi Bhramaramba (a form of Parvathi). The sanctum sanctorium is covered with gold. This temple dates back to 2nd Century AD. 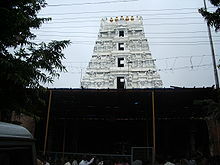 Mallikarjunaswamy Temple is one of the 12 Jyotirlinga temples dedicated to Lord Shiva. It has a unique distinction amongst the Hindu temples of the world; it is the only place to be one of 18 Shaktipithas (most sacred goddess shrines). According to legends, Lord Shiva's sacred bull Nandi is said to have performed penance at the Mahakali temple till Shiva and Parvati appeared before him as Mallikarjuna and Brahmaramba. The temple is built in Dravidian style. It is believed that Lord Rama himself installed the Sahasralinga, and the Pandavas lodged the Panchapandava lingas in the temple courtyard. It is also believed that one of the srisailam caves is said to be the place where the most famous poet and social reformer Akka Mahadevi who hailed from Karnataka, is said to have achieved salvation. Srisalam temple, built in 1520 AD, with 3200 stones, is bounded by a great fort-like wall (20 ft high, 6 ft wide and 2120 ft in circumference). The temple is adored with about 116 inscriptions in and around it. The images of the deities are enshrined in the more recent temple built by the Vijayanagar king Harihara Raya.. It is also believed that Sri Adi Shankaracharya worshipped the deity of this temple. This place is referred as a very sacred river for pilgrims because River Krishna is known as Pathalaganga. Mahashivaratri Festival is the most important festival here. Goddess Bhramaramba festival, which comes one or two months after Shivaratri, is also celebrated here. Dussehra festival and Karthika Poornima festival are also celebrated here. No mobile or camera is allowed inside to take photos. Special darshan tickets (Rs.100/- and Rs.50/-) are available. a. Srisailam Dam, which is 512 mts long, is located here is abundant with natural beauty. The exotic Srisailam temple is 232 km south of Hyderabad. Air and rail facilities are available from Hyderabad. From the Bus Stand, the distance is just 1 km.